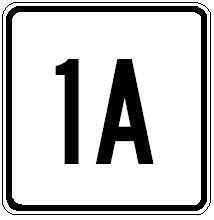 Massachusetts State Route 1A is a north-south highway in Eastern Massachusetts. It runs in three sections. One section runs in Bristol County. The second section runs in Bristol and Norfolk Counties. Section three runs from Downtown Boston, in Suffolk County, north to the New Hampshire/Massachusetts State Line, near Salisbury. Info on MA St Rt 1A is broken down by county below.